My real-life person just stumbled home from a vacation, and I have that crusty feeling about me, that "what did I eat and drink for the past three days, again?" and, "Did I accidentally use the floor mat as a towel?" and, "Why is every bed in creation less comfortable than my own?" My avvie is mirroring the hot mess I am IRL. OK she probably looks a lot more put together. It was a great trip, however, and I got to walk in places that reminded me a lot of Second Life. I went to Tampa Bay and explored the Riverwalk there, several miles of beautifully lit rainbow walkways on the water, under bridges lit from beneath in blankets of shifting colors, past well-maintained parks and a city pulling itself out of suburban sprawl and recentralizing. I do love good urban planning! Also when I returned, I saw that there was a group gift availabile from ~silentsparrow~, this neatly framed art version of the FLF fox tattoo. It matches the rainbow bookshelf, a past group gift, very well, so it's enlivening my living room even now. 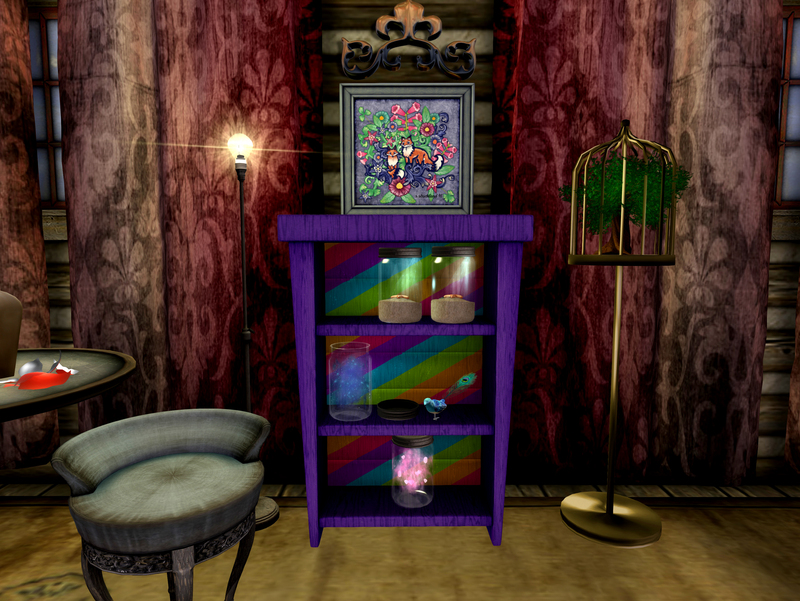 The jars on the shelves are from Schadenfreude, "treasured memories" for Collabor88.